Last week I hosted a "speed friendshipping" event for the women at our church to help them get to know one another better. It was a great night filled with fun conversation, yummy treats, and a lot of chatting. I decorated with cute conversation heart sticks that people used when they were trying to think of questions to ask one another. I ended the night bringing home about 100 doily conversation hearts on sticks. 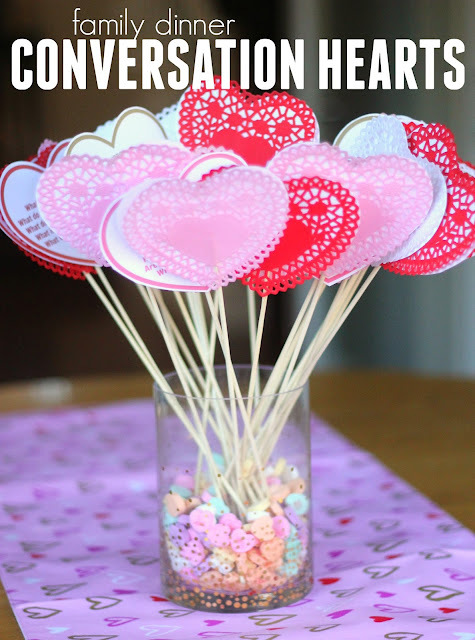 At first I was going to just recycle all of the hearts, but then I decided to take a set of 10 of the hearts and put them in a jar on our kitchen table to use as mealtime conversation starters. Surprisingly a week later only a few of the conversation heart candy pieces have been eaten and we've used our conversation hearts at almost every meal! 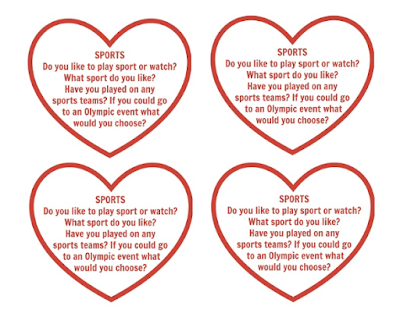 Start by printing out the heart questions onto white or colored cardstock and cutting out the hearts. Next, use double sided tape to tape the heart question and a doily onto a wooden skewer. If you sandwich the skewer in between the doily and the cardstock heart it is super easy! You'll have a whole jar full of heart questions before you know it! Here are my printable questions that we've been using. It is so funny to listen to the answers when we do these at dinner (sometimes kids make things up). I also love using these when friends come over because it is a fun way for everyone to get to know one another better. I made very specific rules that we can only use them at dinner time... which makes them special and makes dinnertime special and kind of exciting. Below the printable hearts are listed. If you have toddlers, add a photo or drawing to the heart so that kids who don't know how to read can use them with minimal help. Having a designated reader also works. My 8-year-old loves reading aloud the questions and helping the little kids ask everyone their questions. Make sure you take a turn to answer questions as well. My kids have loved getting to know me better as we've played! If your child doesn't have any answer for a question, feel free to change the question up. For example, instead of saying "where have you traveled?" ask, "where do you want to travel?' Or instead of "what was your first job?" say, "what do you want your first job to be?" Did we miss any categories? Which would you add to this? 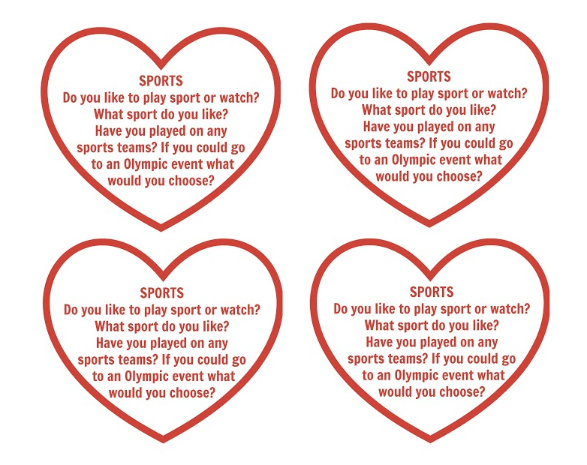 If you don't like these questions, just write your own and put them on a heart! It is simple. I love the elevated conversation at our dinner table lately... that digs deeper than the usual, "how was your day?" question that we always ask. Do you have any other fun ways that you get conversations started at your dinner table? We've done an easy question jar before that was fun too.